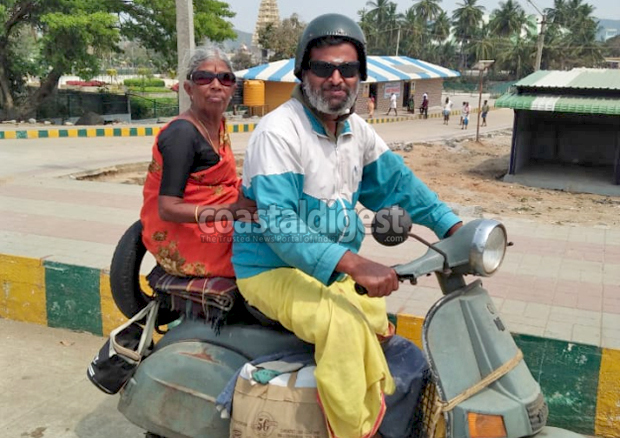 Kerala, Goa, Tamil Nadu, Karnataka, Andhra Pradesh, Telangana, Maharashtra; D Krishna Kumar and his mother 70-year old mother Choodarathna have been making a stopover at each and every temple in the region. "Not many may believe, but in the last 10 months we have covered over 40,000 of such religious places, big or small we surely make it a point to visit those places," Kumar says. Having lost her husband in 2015, in a casual conversation, Choodarathna confided to her son over her inability of not being able to see many places, especially Belur and Halebidu. "I felt terrible when she said that, having travelled across Karnataka due to my profession, I felt guilty for not being able to accommodate such small request of my mother," Krishna said. He adds, her entire life Choodarathna had dedicated herself within the four walls of the 10 member joint family in Mysuru, without any friends or social life of her own. Though she is qualified as a Hindi teacher, yet she did not take up a job, and instead decided to dedicate herself to her family. Krishna adds that he received her utmost care and attention when he grew up. "It was her selflessness that triggered me more to do something for her, so after 13 years being thoroughly employed, I decided to call quits from the job and decided to fulfill her wishes," Krishna says. On January 15, this year, Choodarathna decided to venture on the religious pilgrimage from Mysuru. "Initially we started with Kerala, later we moved towards other places," he says. Incidentally, during the course of the journey, Krishna Kumar sprang a surprise to his mother by taking her to the house of her childhood friends, whom she was out of contact. “I am so thankful for my son for getting me in touch with Chandramathi (Sagar, Shivamogga) and Kaje Jayalaxmi (Vittal, Dakshina Kannada). Have never seen them since the teacher training course over 47-years ago. Unlike these days, we didn't have phone or internet to remain in touch," she adds. Besides fuel, Krishna says there is no major expense incurred on them, although for close to 10 months now a little over a lakh has been spent on the journey. “We are never at a hurry, depending on our interest we move from one place to another, therefore we cannot exactly say how much time we will take to complete our journey and destination,” he says. All through the journey, Choodarathnamma says that they did not stay in a hotel and usually consumed fruits and prepared curry out of vegetables that were made available to them. "We stay at mutts or temples, sometimes locals invite us at their residences. We consume food from the temples and even take water for consumption. By God’s grace, I never had health issues and we never fell ill during the journey," she adds. On being asked, why they preferred scooter, Krishna says that it was his father who gifted him the scooter in 2001. "I am very emotionally attached to this Bajaj Chetak. I feel that my father is along with me and I am only like a charioteer taking both my parents for the place of their liking," he says. Wow.. great.. son should be like this.